Happy Wednesday! Have you been creating something beautiful this week? If you're stuck in a creative rut and don't know where to get started, you're in the right spot! The creativity featured below from design team members all across the globe, will knock your socks right out of the park and you'll be inspired to create your next one of a kind masterpiece that you and your friends will love! Congratulations, Margie Malone....she won the $25 Heartfelt Creations shopping spree from the alumni blog hop. Instructions: Start with the 5" x 7" upright foldout card base from the Kraft Foldout card set. Cut paper pieces from the O Holy night paper collection to fit the base and each side of the foldout layers. Use from the Classic Borders Die to cut a matching border along the top edges of paper. Watch the video above for a quick tip on how to use the dies with foldout card. Sponge edges of the paper panels with Memento Rhubarb Stalk ink and attach onto coordinating panels. Stamp the medium and small poinsettias from HCPC-3822 Poinsettia & Holly Clusters, the angel and shepherds from HCPC-3832 O Holy Night and Merry Christmas message from HCPC-3833 Silent Night Scroll stamp set in Archival Black ink onto white cardstock and diecut with coordinating dies. Stamp the Bethlehem skyline 2x in Encore Gold ink onto white cardstock, then heat set with Ancient Gold embossing powder and cut with coordinating die. For detailed color application, use the Stack and Store daubers and Dove Blender pen along with the following inks to color. For the little angel, use the Rose Coral and Rich Cocoa ink. For the shepherds use Danube Blue, Bamboo Leaves, Desert Sand, Rhubarb Stalk and Rich Cocoa ink. For the Christmas message, use Rhubarb Stalk ink. For poinsettia and holly leaves, use Rhubarb Stalk and Bamboo Leaves ink. Use the poinsettia shaping mold to shape poinsettias and leaves. You can see a tutorial at https://youtu.be/FSdPL7nXvQE. Assemble 2 of the medium poinsettia and 1 small poinsettia. Pierce a hole in the center of all 3 poinsettias and leaves, then thread the gold stamen through, using hot glue to attach. Trim off excess wire from the backside of poinsettias. Use the shaping stylus to shape the shepherds and angel. Attach everything onto card as pictured. Use Dries Clear glue to add a touch of gold glitter over the flowers, leaves and rest of card as desired. Instructions: Card size: 4 1/4 x 5 1/2". Cut card panel 11 X 4 1/4", score at 5 1/2 then fold to make the card base. Cut top edge of the front with the Classic Border Basic plain edge die so that the front measures approximately 2 1/2 inches and then cut the top edge of the back so that it measures approximately 3 3/4 inches. Cut on score in the middle from top edge of back down to cut edge in front (about 1"). Cut a front and inside panel from decorative paper and cut them to match the curves of front and inside (see Emma Lou's video for an easy way to do that here: https://youtu.be/wxX94X84kUo.) Now cut 2 white Delicate borders and glue one to each of the top edges to match curves. Trace the die onto decorative paper (to match the sky) and hand cut a backing for the back edge behind the Delicate border. Sponge glue onto the front of card and the inside of card and apply ultrafine glitter. Stamp Bethlehem 2 times in black and die cut, 1 time reversed in black (stamp onto plain rubber then plain rubber to paper, hand cut) and then 1 time in London Fog and 1 time in Shadow Gray, die cut. Glue and foam tape the layers of Bethlehem onto front staggering a bit right and left to get layers of town. Punch grass from decorative paper for front and glue to the bottom. Stamp angels, shepherds with black ink and die cut. Stamp the left shepherd again and hand cut (carefully cut lamb away from hand). Stamp the Holy Family twice and use the 2nd one to cut away cow and lamb to use. Cut a circle from decorative paper and ink the inside part to make a "cave" or stable. Color all pieces with Copic markers. Stamp just the star part of Bethlehem with VersaFine and emboss with gold and glitter white hot, die cut. Glue circle to bottom of inside (right) and cut off the bottom of circle. With white, paint shine lines on front and on inside coming from the star foam taped onto top center of inside. Now glue Holy Family in the center of "cave" and glue extra cow and lamb to right side, glue extra shepherd with his hand on donkey. Punch grass for the bottom, glue and then paint glue on all straw area and sprinkle with Pure Gold Dust. Glue extra lambs and shepherds to the inside (left). Close the card and use foam tape to adhere the angels. The right angel should hang down low enough to act lie a catch to keep card closed but not enough to make it difficult to open and close. Instructions: The ready side fold card base from smooth white cardstock measures 5 1/2' by 7 1/2". To prepare the top panel, choose a paper from the designer paper collection and cut to size measuring 5" by 7 ". With the help of the second largest die from the Eyelet Circle & Basics Small Die, cut a window as shown. Also using outer 2 dies from the same set, cut a frame from white cardstock. Adhere the frame around the window as shown. To the top panel, create a white mat using smooth white cardstock measuring, 1/16th of an inch larger. In between both the layers, add an ornament die cut from golden mirror sheet, using Noel Ornament Die. Stamp the images from Silent Night Scroll Cling Stamp Set using black archival ink and color them using Zig Clean Clear Brush Markers. Cut the images with their coordinating dies. Also, stamp the sentiment banner from Silent Night Scroll stamp set with black archival and paint it with zig markers. Cut multiple pieces and stack them together to add dimensions. For Poinsettias, stamp the images from the Poinsettia & Holly Clusters Cling Stamp Set using white color box ink on Papericious vellum cardstock, sprinkle with white heat embossing powder, dust extras in a funnel tray and heat set them using a heat tool. Cut all the images using their coordinating dies. Color the Poinsettias using Candied Apple Distress Oxides from the front. Let the color sit for a while then buff the images using a damp cloth. Shape all the flowers on the back of the stylus. For Poinsettia leaves, stamp the images from the same stamp using Fern Green Archival on white cardstock and color them using Leaf Green Archival Ink. Cut all the images using their coordinating dies and shape them on the back of stylus. Glue them to the flowers and add golden glittered micro beads to create the flower centers, using an adhesive that dries clear. For more tips on creating with the flower shaping molds, watch the tutorialat https://youtu.be/FSdPL7nXvQE. Instructions: Take a sheet of Red cardstock 12 x 12" for the base, take a light piece of Paper from the collection and cut this at 11 3/4 x 11 3/4" and glue this on top of the red cardstock. Now take a piece of Blue Cardstock and cut this at 8 x 11 3/4". Take a piece of gold paper and cut this at 7 x 11 3/4" and glue this on top of the Blue Cardstock in the center, then cut a piece of paper from the Collection at 6 x 11 3/4" and glue this on top of the Gold paper in the center. Take a piece of wire and put the beads on it - start with 2 gold, 1 siver, 2 gold and so on, till you have the length you want. Now fold the top of the wire over the 3 pieces of paper you just glued down and secure it on the back with a piece of tape, now glue or tape the whole piece down on the first 2 papers. Take the outside of the ornament die and cut I out of the blue cardstock, now cut the ornament of gold shiny cardstock and glue this on the blue ornament. Tape the whole ornament down with 3D foam on the bottom side of the wire with the beads. Make a nice red bow and glue this on top of the ornament. 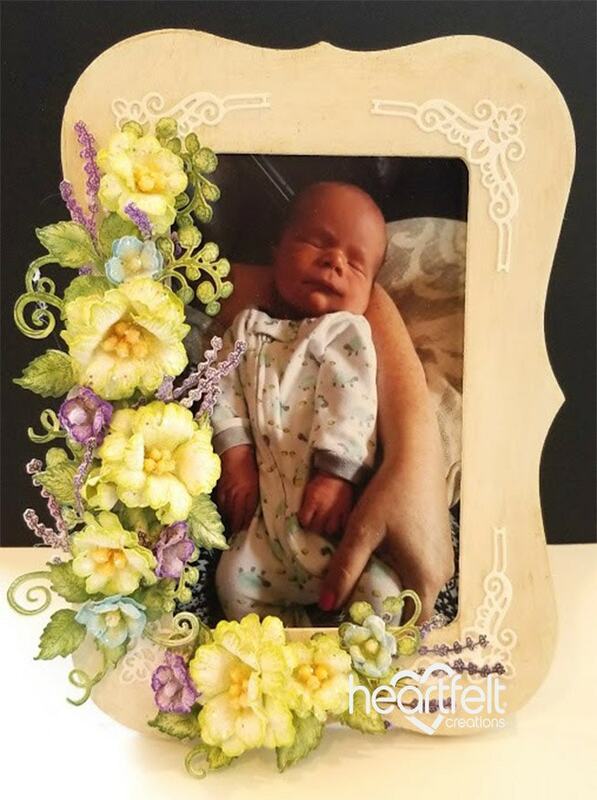 Print you photo and mat this on Blue cardstock and then on the shiny Gold Cardstock, cut a frame with the eyelet Lace Frame die out of the Blue cardstock and cut 1 half off, glue this half under the frame on the left side. Tape this down on the left side of you layout. Take a strip of the Bling on the roll and glue this under the photo from left to right. Stick some snowflake stickers down, wherever you like. Take the Poinsettia & Holly Cluster stamp and your Graphite Black Ink and stamp some of the poinsettias and the clusters on White Cardstock, color the Poinsettia with a mix of the lady bug and Pearlescent poppy, and the clusters with Bamboo leaves, then take the Nuvo drops Red berry and put them where the berries are, let them dry Cut them all out with the coordinating dies and shape them with the 3D Poinsettia mold, the clusters you shape on your mat from the shaping kit. Take some Glue on a sponge and tip the ends of the Clusters and sprinkle some frosting powder on them and melt it with the heat tool. Make a hole in the center of the poinsettia and put a stamen through, now tip some Glue in the center and sprinkle some of the Shard glass on it, let it dry. When all the flowers and leaves are dry you can place them on the left upper corner of the photo and under the bow on your ornament. Stamp with the Graphite Black and the word stamp from the Silent Night scroll stamp on white cardstock and cut it out with the connected die and color it with the lady bug, then cut it again from the gold shiny cardstock and glue this under the red word as a shadow and stick it down under the photo. Take a Black Fine liner and doodle a little bit next to the edge of the whole layout. Other Products: Gansai Tambi Watercolors, paint brushes, Canson watercolor cardstock, Diesire Embossalicious Petite Dot Embossing Folder and pearls. Instructions: Cut a piece of 8 1/2" x 5 1/2" piece of Rajni Chawla's Vellum Flowerite and score it at 4 1/4" to make the card base. Emboss the front half of the Vellum using Diesire Embossalicious Petite Dot Embossing Folder. Die cut a 2" x 5 1/2" piece of white cardstock using the die from Fleur Border Basics Die and adhere it to the card front as shown using Designer Dries Clear Adhesive. Adhere a 1" x 5 1/2" strip of white cardstock on the inside of the back flap of the card to write message. Stamp the images from O Holy Night Cling Stamp Set using Black Archival Ink on watercolor cardstock and color ithem using Gansai Tambi Watercolors. Die cut them using matching dies from O Holy Night Die. Adhere them to the card front using Designer Dries Clear Adhesive. Add pearls to the border die cut to add finishing touch. Instructions: Click here to view a larger photo of this project. Cut burlap to the size of the hoop and adhere with clear drying glue. Cut pattern paper to different sizes, distress the edges and layer on top of each other with 3D foam tape as shown. Die cut gold mirror cardstock using Festive Holiday Die and adhere it on the right side of the hoop. Stamp white cardstock with images from O Holy Night Cling and Silent Night Scroll Cling Stamp Set using Archival ink - Sepia and cut using coordinating die. Color the images using pencil and water colors. Stamp red and green cardstock with Poinsettia & Holly Cluster Stamp using Archival ink Jet Black and die cut using coordinating die. Using Luggage and Tags Die cut out sentiment tickets from the paper collection. Shape the Poinsettia flowers using the Groove tool and use prills for the flower center. Arrange the flowers and images as shown. For more tips on creating with the O Holy Night collection, watch the tutorial at . Instructions: Cut a piece of white cardstock 10" x 7", score at 5" along the long side and fold to create a 5" x 7" base card. Cut the borders from the HCD2-7190 Frame a Card Leafy Borders die set in white cardstock and add Frosting Powder using Dries Clear glue. Adhere to the base card. Cut a piece of white cardstock 3 1/4" x 5 1/4" and then die cut the centre of the HCD1-7191 Intricate Swirls Frame die set in white cardstock and adhere it to the base. Adhere this to the card base over the frames with foam tape. Die cut the Silent Night out of white and pale blue cardstock and offset the blue die under the white die to create a shadow and adhere to the front of the card. Stamp the poinsettias from the HCPC-3680 Sparkling Poinsettia Stamp set in French Ultramarine ink on the Art Foam Paper and die cut with the coordinating die. Add blue stamp paint to the edges with a damp sponge and Frosting Powder to the flowers with a damp sponge. Heat and shape the poinsettias and assemble. 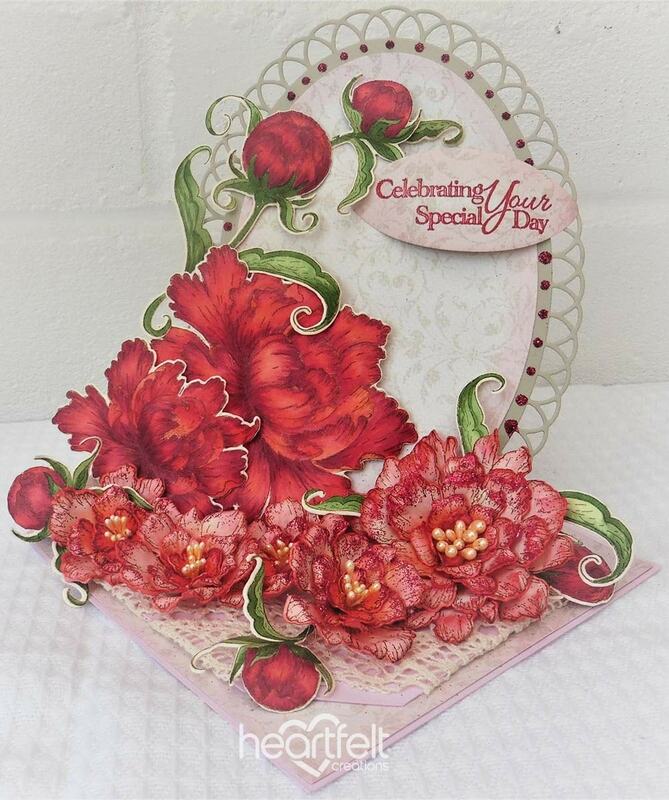 Add blue stamens to the centres of the flowers and adhere around the bottom left of the card. Stamp the angels from the HCPC-3832 O Holy Night Stamp set in VersaMark ink on Vellum and emboss with white embossing powder. Die cut with the corresponding die and adhere to the bottom right and the top left of the card nestled among the poinsettias. Instructions: Prepare a white card base 5 x 7". Die cut one of the Eyelet Lace Frames out of white cardstock and adhere to card. Cut the Noel Ornament layers out of white, Stamp the sentiment in the center and add foam dots to the back then adhere to card. Stamp the flowers on white with the Red Geranium, color with the Carnation Red, cut out using the matching die, place in the 3D Poinsettia Flower Mold, run through your die cut machine, shade the edges with the Vermillion ink. Stamp the leaves on white with the Olive, color in with the Leaf Green, cut out with the matching die, place in the flower mold and run those through the die cutting matching. Shade the edges with the emerald green ink. Put the flowers and leaves together. Adhere to the card, add Prills to the center of each flower. Add glitter to the leaves, flowers and ornament using dries clear adhesive to finish the card. 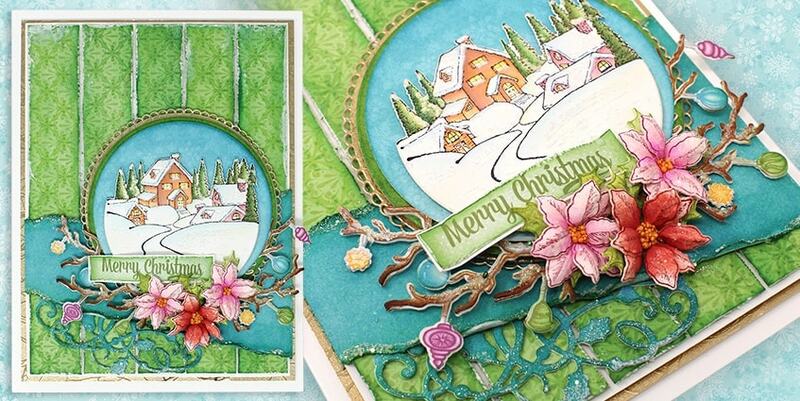 For more tips on creating with the Celebrate The Season collection, watch the tutorial at https://youtu.be/ePihXJz9zSQ. Instructions: Click here to view the inside of this project. Cut red card stock 7" x 10.25", score 10.25" side at 5" and 5.25", fold on score lines. Cut red plaid design paper 4.75" x 6.75". Cut 4 pieces of white card stock 6.25" x .5". Die cut 4 scallops with the Border Essentials die. Adhere around the edges of the plaid design paper and add to the folio. Cut a piece of white card stock 2.875" x 2.75", add to red floral cut apart. Add to folio. Using the Silent Night Scroll die, die cut 'Silent Night' from white card stock and gold mirror card. Adhere the white over the gold, slightly off setting. Adhere to the red cut apart. Stamp the pinecone on kraft card stock with StazOn Saddle Brown, die cut. Using the Celebrate the Season Cling Stamp, and white card stock, stamp 4 flowers with Black Cherry and 2 leaves with Color Box, Grass. Using the daubers, color them with the same inks. Die cut. Dab VersaMark on the flowers and add Clear Gold embossing powder. Adhere the flower layers together and add a generous amount of Designer Dries Clear Adhesive in the center and add gold micro beads. Add a drop of Nuvo Crystal Drops, white. Use 2 flowers and 1 leaf to make 2 flowers. Save one for the inside. Die cut Peace and Noel from design paper, add shabby white embossing powder. Layer pinecone, 'peace', and flower and add to card. Make a double bow with red and white polka dot ribbons. Tie 3 bells on gold thread and tie around the center of bow. Add bow with 'Noel' tag to front of folio. Add pom pom trim. Left inside: Cut a piece of green design paper 4.75" x 6.75". Cut 2 pieces of white card stock .5" x 6.25" and die cut using the scallop die. Using 1 of the 5.125" x 3.875" panels, cut off .125" on each side. Add the scallop border to top of green piece and card panel. Add green piece to folio and then add card panel, adding adhesive to both sides and bottom to create pocket. Add to folio. Using oval cutter, cut a 2.5" oval. Stamp 'Merry Christmas' on white card stock with Jet Black. Add Nuvo Crystal Drops, gloss white. Cut a piece of red card stock .375" x 6.5", crimp with crimper, adhere around oval. Add to pocket. Add checked ribbon. To create card, cut white card stock 8.25" x 6.125", fold in half. Add 4" x 6" card panel, add to card. Cut white card stock 3" x 4.75", stamp greeting with Jet Black. With red gel pen, draw stitching lines, add to card. Add gold Stickles around edge and add flower. Inside right: from white card stock, cut 5 pieces .5" x 6.25". Die cut scallop with Border Essentials die. Cut a piece of plaid design paper 4.75" x 4.5", add scallop border to top and add to top of folio. Cut 3 pieces of design paper 5.75" x 4.5", score 5.75" side .5" on each side to create tabs, fold under. Add scallop border to top edge and then adhere tabs and bottom edge to folio to create pockets. Use a 5.125" x 3.875" card panel, cut to 4.75" x 3.625", add scallop border to top, adhere sides and bottom edge to folio. Die cut 4 ornaments from white card stock. 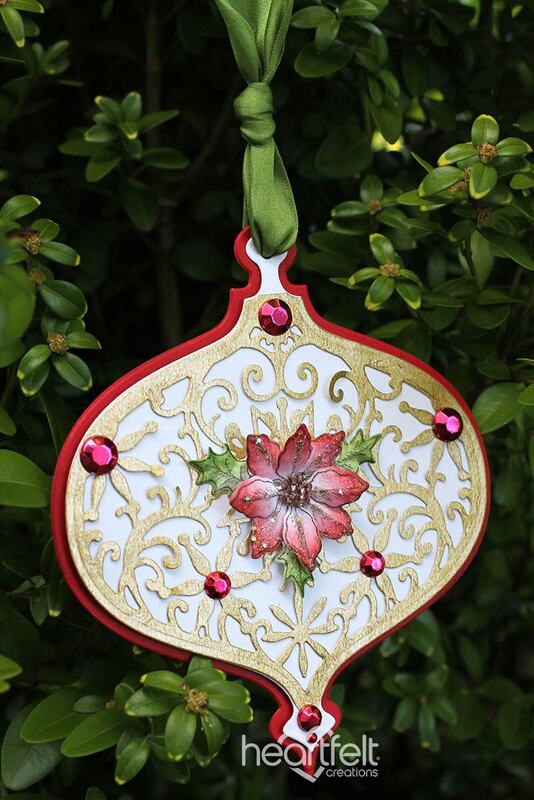 Choose 4 different colors from design paper to die cut inside ornament, add to white ornament. Using the Noel Sentiments Stamp Set, stamp 4 sentiments on white card stock with Black Cherry, die cut. Add to ornament. Stamp angels on white card stock, color with Prismacolor pencils and die cut. Add to folio. Stamp city on white card stock with VersaMark, emboss with Embossing Pearl, Silver. Die cut from black card stock. Adhere embossed piece over black piece, off setting slightly. Add to folio. Instructions: Click here to view a larger photo of this project. My tag measures 5 x 8 1/2". I made my own tag by cutting two pieces of cardstock to specifications and then gluing them together. This makes the tag a bit stronger and able to handle whatever you may want to put on the front. Cover the tag with a piece of the paper collection (I chose red). Punch a whole in the top of the tag and then set it aside while you prepare all the elements. Using Rhubarb Stalk Memento Ink stamp the poinsettia flowers onto white cardstock and color with a sponge dauber and Lady Bug Memento Ink. Use a coordinating die to cut out. Lay the flowers and leaves onto the 3D Mold and spritz with water then run through the Vagabond. Lay aside to dry. Once dry you can add the Prills to the centers and the glitter to the edges of the flower petals. I used a sponge and dries clear glue to add glitter. Set the flowers aside to dry. Once dry glue the petals and leaves to form a flower. Cut out the ornament twice, once with white cardstock and once with gold metallic and glue the pieces together to form the white snowflakes and gold background. I used the sponge and glue to adhere glitter to the snowflakes part of the ornament and set aside to dry. Using the green metallic cardstock and the circle die, cut out the circle and glue the ornament to the circle. Set the green piece aside and go back to the ornament. Tie a piece of green ribbon around the top of the ornament and glue the poinsettias to the top as well. Set aside to dry. Once dry glue the ornament onto the green circle. Stamp the angel with VersaMark ink and emboss with gold embossing powder. Using a brush and water, color with the distress inks. Use dimensional tape to adhere the angel to the green circle. 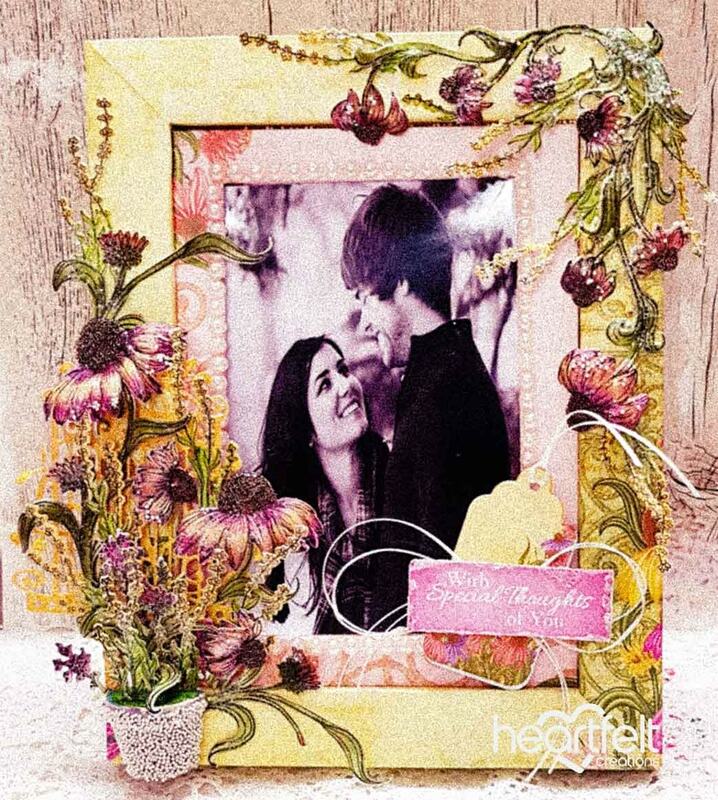 Cut out the Sweetheart Borders lace die using white cardstock. Using the Scor-Tape adhere the green ribbon to the top of the lace. Tie a green bow and adhere to the center of the lace. Glue it down onto the tag front. Now glue the ornament and circle over the piece of lace and allow to hang off the side. Cut out one of the tags from the paper collection using the Luggage and Tags Die and mat with a piece of the green metallic cardstock and then with a piece of white cardstock. Use dimensional tape to adhere to the tag and add another angel to the side. Tie a piece of green ribbon to the top of the tag and your tag is finished. Instructions: Make the card base from white card stock. Cut white card stock 12 inches by 6 inches and score on the 6 inch mark. Fold and make a 6 inches by 6 inches card base. Adhere a mat layer of brown card stock measuring 5.75 inches by 5.75 inches on the card front. Cut the third mat layer of white card stock 5 inches b 5 inches and adhere on the brown mat layer using foam tape. 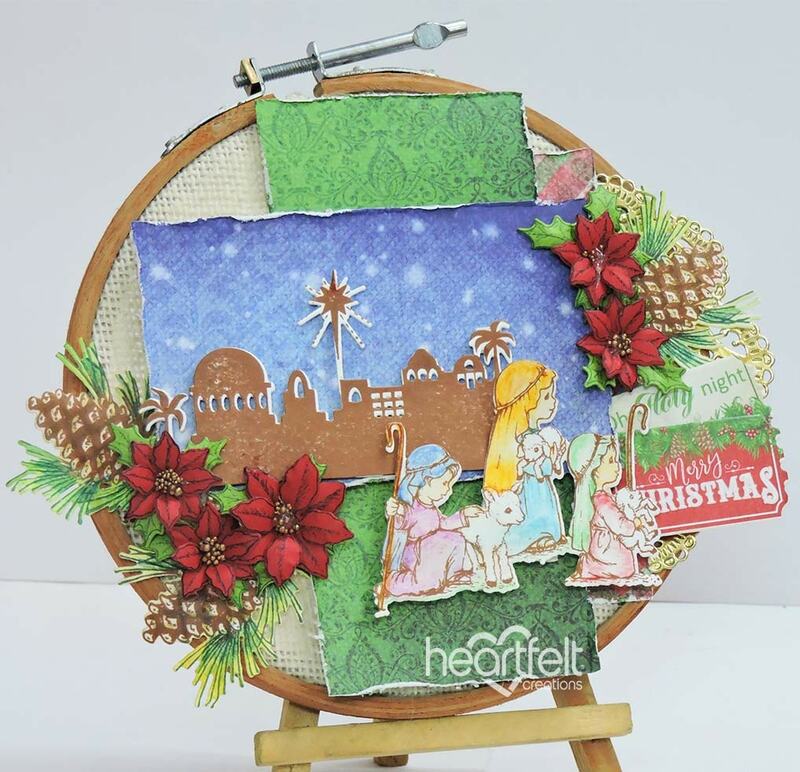 Add a pattern paper mat layer on this from the paper collection. The fourth mat layer of the pattern paper is a little smaller than the base layer. Fold and make the 5 inch by 5 inch shadow box. Adhere the flaps and stick it on the card front a little towards the left. Cover the inside and the sides with pattern paper from the paper collection. Cut the front opening with the cut mat create die. To decorate the inside of the box, cut a pattern paper to fit inside the box and cut its top edge with the straight edge border die. Cut the fleur border die in white card stock and adhere to this layer coinciding with the edge. Cut a sweet heart border die in white card stock and add to the base of the shadow box. Cut a die cut in red pattern paper from the paper collection using the mat layer of the decorative medallion die. Adhere to the top of the shadow box. Cut the decorative medallion die and adhere on this red layer. Stamp merry Christmas sentiment with embossing ink on a oval die cut. Add gold powder and heat set. Adhere this on the decorative die with foam dots. To make poinsettias, stamp the flowers on white card stock with vibrant fuchsia ink. Color with rose madder and cut with coordinating die. Shape the poinsettias using the 3D poinsettia flower shaping mold. Add the glitter balls in the centre. Make leaves in same manner. Adhere the flowers on the leaves. Stamp tree image with embossing ink. Add white powder and heat set it. Cut with matching die. Colour the trees using green archival ink. Adhere on the card using foam dots. Finish the card by adding glitter powder on the flowers. Instructions: Score a piece of white cardstock to 6.25 x 6.25" this will be your card base, set aside. Now take one of the 6 x 6" card panels from the sheet from your O Holy Night paper collection. You will then take your cut mat create die and cut out the center. Next take a piece of clear cardstock and cut to 5.75 x 5.75" and adhere it to the 6 x 6 panel to create a see through window. Now cut a piece of patterned paper to 5.75 x 5.75" this will be adhered to the back of your see through window piece you just cut. Instructions: Card size is 5 1/2 x 4 1/4". Cut red cardstock 4 1/4 x 11", score and fold at 5 1/2 inches to create an A2 tent fold card base. Cut white cardstock 5 3/8 x 4 1/8" and emboss using a holly or other Christmas themed embossing folder. Adhere to card base using dries clear adhesive. Cut a piece of green paper from the O Holy Night paper collection 5 1/8 x 3 3/4", distress the edges and adhere to card base using dimensional dots. Sponge the edges with glue and sprinkle with Rajni Chawla's crystal clear glitter. Randomly sponge and glitter the design on the paper. Cut another piece of the green designer paper 5 x 4" and adhere to the inside of the card. Cut the smaller Intricate Swirls Frame Die from white cardstock. Sponge the outer frame with dries clear and sprinkle with crystal clear glitter. Stamp the sentiment from the Festive Holiday Cling Stamp Set on the center portion of the diecut with VersaMark. Sprinkle with gold embossing powder and heat set using the Heat It tool. Adhere the outer frame to the card base using mini dimensional dots and adhere the inner frame using dimensional tape. Stamp the Poinsettias on red cardstock using Archival Jet Black ink and diecut using the coordinating die. Stamp the leaves on green designer paper and diecut using the coordinating die. Place the flowers and leaves in the Poinsettia shaping mold, spritz with water and run through the die cutting machine. Press the centers of the flowers down using the Deluxe Flower Shaping Kit. When dry, glue two petals together, adhere to the leaves, sponge with dries clear adhesive and add Rajni Chawla's Crystal clear. Add dries clear to the centers and sprinkle with Heart of Gold Prills. Add red berry crystal drops to one of the holly leaves. Make a triple loop bow from sheer red ribbon and adhere to the card base as shown. Adhere the holly leaves to the center of the bow. Adhere the poinsettias using a hot glue gun. Other Products: White cardstock for die cutting and stamping, Manilla tags large, green ribbon, thin gold ribbon, Memento Expresso Truffle, Archival Jet-Black ink, Versafine Smokey Grey, Distress Antique Linen, Walnut Stain, fired Brick, Aged Mahogany, Forest Moss, glossy accents. Instructions: Click here to see a larger photo of this project. 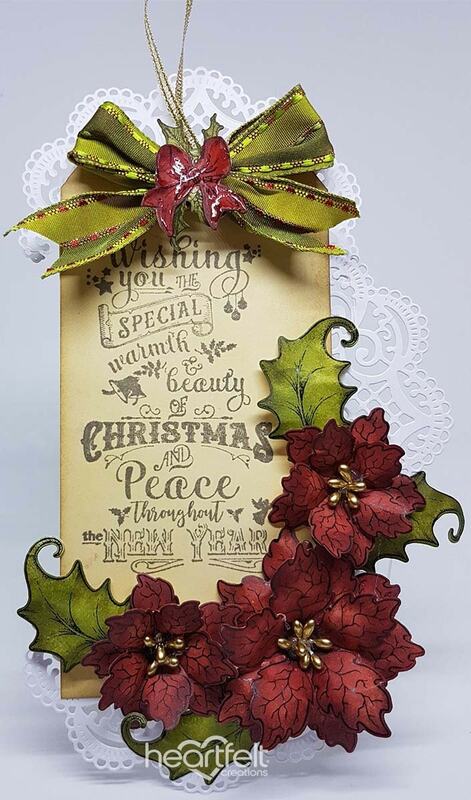 Using your Noel Sentiments Stamp set, stamp using Versafine Smokey Grey onto your tag leaving a little room at the bottom to adhere flowers and room at the top for the ribbon. On your second tag stamp the Merry Christmas Stamp at the top of your tag using the stamp from the Noel Sentiments set using Archival Black ink. Sponge the tags using the antique linen and highlight the edges with the walnut stain. Stamp your Sparkling Poinsettias using archival black ink and color with the fired brick and highlight with aged mahogany. Cut with coordinating die. Stamp your holly leaves from the Large Sparkling Poinsettia Stamp set using the archival black ink and color using the forest moss, highlight a little heavier around the edges with the forest moss. Cut with coordinating die. Shape using your Deluxe Flower Shaping Tool Kit. Adhere your flowers together, I have used 2 of each size. Using a hot glue gun, adhere gold stamens to the flower centers. Stamp your bow stamp using the stamp from the Silent Night Scroll set using archival black ink, using your stack and store daubers color the bow in red using a mixture of the fired brick and aged mahogany and color the leaves using the forest moss. Fussy cut the bow and cut a couple of the leaves, you will not be using the sentiment section. Tie a bow out of your green ribbon and using a hot glue gun adhere a leaf in the center facing up and down and adhere the bow over the top, apply glossy accents to the bow. Thread your gold ribbon through the tag to create your hanger and using the hot glue gun adhere the bow to the top of the tag. Using your Festive holiday die cut 3 die cuts. Adhere the die cuts to the back of your tag as pictured. Adhere the second tag at the back to conceal the dies and to have somewhere to write your message. Adhere your flowers at the bottom of the tag with the largest in the corner and 1 flower to the left and right and adhere your leaves as desired. Instructions: Click here to view a larger photo of this project. 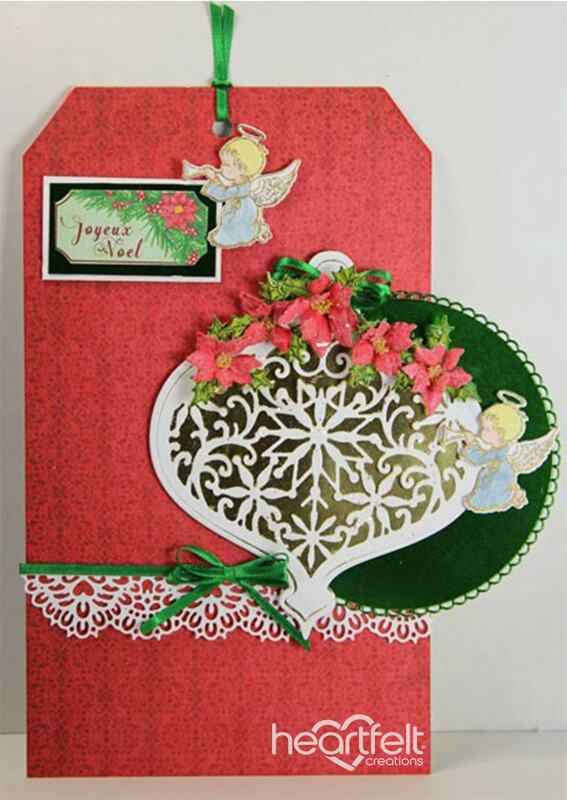 Die cut 2 of the largest Noel Ornament Die in red cardstock and adhere these together, to give a sturdy base. Die cut 2 of the next largest die in white cardstock. Adhere these to either side of the red cardstock layer using crafty foam tape. Die cut each of the intricate ornament topper dies in gold specialty paper. Adhere the full intricate image directly to the white cardstock. Adhere the banner and swirls image to the other side using 3D foam squares. Punch a hole at the top of the ornament for ribbon. Stamp and die cut 1 set of the larger poinsettia flowers and holly leaves onto white cardstock using dark brown ink (Early Espresso). Add color to the flower and leaves using ink and daubers (Riding Hood Red and Cucumber Crush). Use the 3D Shaping Mold to shape the images. Assemble the flowers and add Crystal Clear Glitter to the petals using liquid adhesive. Let dry. Add beads to the middles of the flowers using liquid adhesive. Let dry. Adhere one poinsettia and 3 holly leaves to the full intricate gold die side. Also add a few gems. Add large gold gems across the border of the banner side of the ornament. Also add small red pearls around the design. Add 1.5" green silk ribbon to the top of the ornament. Instructions: Click here to view a larger photo of this project. Score a 10" x 5" piece of white card at 5" and fold in half. Score the front square diagonally corner to corner and fold the triangle up to give your easel card shape. Edge the square base and front triangle in chalk cloud ink. Select the paper from the pad and cut a square slightly smaller than 5", a triangle to match the front of the easel card and the largest basic oval from the eyelet oval die set. Edge all of the pieces in chalk cloud ink and adhere the square and triangle to the card. Die cut the large eyelet oval in Sahara Sand card and add nuvo drops around the edge, cover in glitter and remove excess. Adhere the oval paper to the eyelet oval and mount onto the triangle using foam pads. Cut a triangle of white card to fit on the base square, colour using chalk cloud ink and add a 2" lace ribbon around the card. Trim off the front point of the card and glue onto the base card using hot glue. Stamp both peony blossoms onto cream card, also 2 large buds and 3 small buds in Soft Suede ink and colour using copics. Die cut and shape using the flower shaping kit. Make the peonies: Stamp the flowers onto cream card using soft suede ink and die cut. Add Real Red ink to the outer edges and Poppy Parade ink from the centre fading out to the edge using sponge daubers. Place face down into the flower shaping mold, spray lightly with water and run through the die cutting machine. Finish off the shaping using the flower shaping kit. Layer the petals together using wet glue - use 5 layers for the large flower and 3 layers for the smaller flowers. Make a hole in the centre of each flower and thread 10 stamens into the centre. Secure with hot glue. Add a small amount of wet glue to the edge of the flowers and sprinkle on glitter, remove excess and allow to dry. Stamp the sentiment onto coordinating paper using the real red ink, add clear embossing powder, remove excess and heat to set. Die cut into an oval using the basics small die set, edge with chalk cloud ink and curve slightly before adding to the card. Position the flowers onto the card using hot glue. Instructions: Click here to view a larger photo of this project. Paint frame with Porcelain color chalk paint, once it's dry, mix clear wax (about 70%) with Antique wax (30%) and rub down the frame for a vintage look. When dry, adhere the corner dies created with the Butterfly Kisses Decorative Die in white cardstock. Stamp and sponge the Small Sweet Peony in Leaf Green, stamp the smallest of the peonies in Summer Sky and Vibrant Violet and cut out with corresponding dies. Sculpt according to peony tutorial, add stamens and Crystal Clear glitter. Stamp and sponge leaves from the Leafy Accents in Bamboo leaves and cut out with corresponding dies, sculpt with the Leafy Accents Shaping Mold. Stamp and sponge leaves from the Wildwood Florals set in Bamboo Leaves and cut out with corresponding dies and sculpt with the Deluxe Shaping Kit. Stamp the wildflowers from the Backyard Blossoms set in Black and sponge with Vibrant Violet, cut out with corresponding dies. Adhere leaves and flowers around frame as shown. Instructions: Click here for a larger view of this project. First choose a pattern paper from the designer paper collection to create shadow frame which is 9"x7"x1". Take a thick chipboard 9"x7" and cover it with another pattern paper from the same paper collection. Glue the frame on the chipboard. Arrange the strip light on the frame. Choose another pattern paper from the same collection and create a one more shadow frame, which is 8"x6"x1/2". Glue a picture inside the frame. Glue half cut pearl as shown in the picture. Arrange the frame in the ready large frame as shown. Stamp flowers on the white cardstock from the Blossoming Coneflower Stamp using black archival ink. Also stamp some fillers from the Backyard Blossoms. Cut the flowers and fillers with the coordinating die. Color the flowers and fillers using Archival inks. Glue the micro beads in the center of the flowers. Cut a cage using Sweet lilac scroll and cage die. Take a miniature pot and cover it with micro mini pearls. Arrange the flowers and fillers in the pot. Glue the cage and pot on the right side of the frame as shown. Also glue the flower corner on the left side of the frame as shown. Cut a tag and a sentiment ticket from the same collection. Tie a cord on the tag. Distress the edges of the sentiment ticket using scissors and apply glitter on the edges. Glue the tag and sentiment ticket using dimensional tape for added dimensions. For the finished look add micro mini pearls on the flowers. To create flowers, stamp the Large Sweet Peony Cling Stamp Set on foam paper with Ranger Archival Ink Pad - Garden Patina and cut using the coordinating dies. Colour with Gallery soft oil pastels 242. You will need 2-3 petals for each flower to create flowers. Stamp the Flowering Dogwood Cling Stamp Set with Ranger Archival Ink Pad - Garden Patina and cut using the coordinating dies. Colour with Gallery soft oil pastels 224, 241. You will need 2 petals for each flower to create flowers. Stamp the leaves using Leafy Accents Cling Stamp Set on the white paper with StazOn Ink Pad - Olive Green, cut out with the coordinating die, shade use this same ink and shape using Leafy Accents Shaping Mold. I adore the white on white with a hint of blue. It looks truly exquisite. Thanks for another lovely idea for my Christmas cards. BTW there is a reason they call the color "Mary blue"....HER head cover is always blue. Thanks for all the inspiration. Just beautiful and so inspirational. I love the look of pine cones and poinsettias on the same project. Enjoyed seeing every one of the projects on this blog entry!